How do you draw the rain? 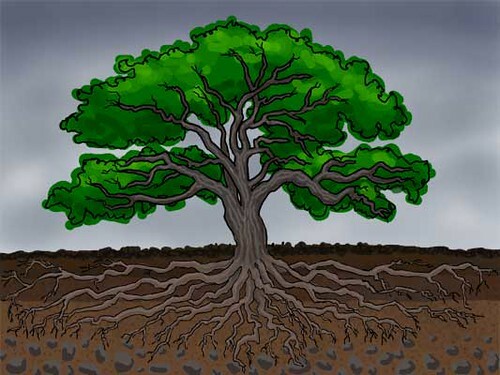 Here’s another look at the recent project oak tree project for TreePeople. The overall story was that rain falling on a tree gets captured in the canopy and funneled down to the aquifer as it drips down the branches and trunk to the roots—essentially, that trees function as water-storage tanks during a rainstorm. Excellent, really dynamic ideas to work with here. Only, wait…how do you draw rain? 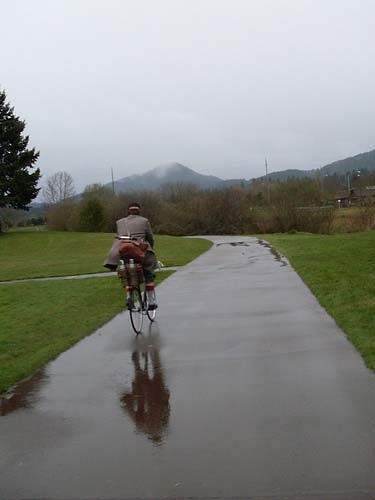 Being a literal-minded gal, I looked up photos from an especially rainy bike ride: the first ever Tweed Ride in Eugene. We’re talking, sopping wet, head to toe, bowties drooping with the weight of the water. (Thank goodness we were all wearing so much wool!) What did the rain look like on that day? Alright, I’m surely not the first artist to ever run into this question. Let’s look at some established traditions of representing rain, keeping in mind that this project is skewed more towards symbolic visual language than photorealism. 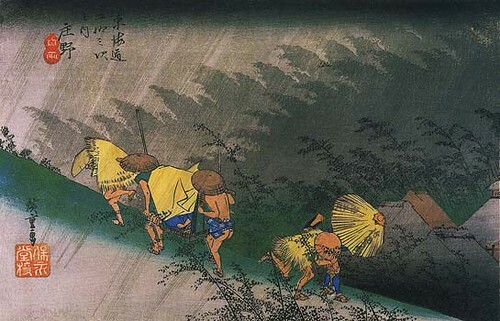 Hey, check out what Hiroshige was doing in his woodblock prints back in the 1800s! The dark band at the top of the sky sure is a simple and effective cue for “storm,” isn’t it? Hmmm. Even though parallel stripes showing falling rain has turned into a silly comic-strip kind of shorthand, it does get the message across. 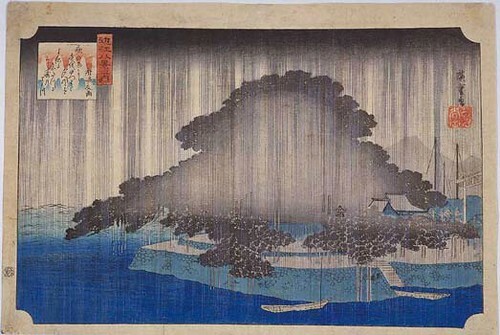 And Hiroshige sure can make it look elegant. Since we’re closely following the path of the water throughout the presentation, we’ll want the rain to really stand out. Let’s reach back into the box of crayolas and pick an archetypal bright blue to represent the raindrops. Doesn’t make any rational sense for drops of water to be reflecting bright blue sky on a cloudy day, of course, but the symbolism is very easy to recognize and follow for the purpose of the presentation. Well there we have it. Thanks, Hiroshige.